Dirty filters or clogs - A clogged air filter can make a furnace have to work harder than usual to circulate air. If the furnace is forced to operate for an extended amount of time with a clogged filter, the furnace can suffer damage. Overheating - Sometimes a furnace overheats due to improper airflow. This can cause a vicious scycle . Electrical problems - This could include issues such as a broken ignition or pilot light, and can negatively affect furnace operation. Thermostat malfunction - Sometimes the problem is not with the furnace itself - but with the thermostat. If the thermostat is malfunctioning it can lead to problems that appear to be furnace related. Age related issues - Older furnaces may cease to function at their optimal level, with an estimated 60% efficiency after ten years. Sometimes repairs are enough to help, and sometimes a full replacement is needed. Mechanical problems - These can manifest as unnatural noises coming from the furnace, such as rattling or squeaking. A clogged burner or other mechanical problem may need to be addressed. 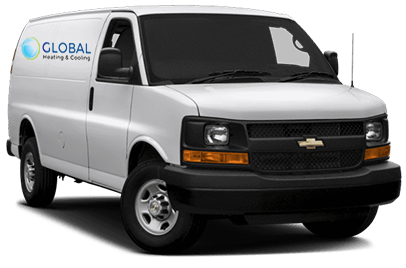 If you are changing your air filter regularly, and your furnace is still not functioning correctly, Global Heating & Cooling is here to help! Whether your problem stems from something that is already mentioned or not, we will work with you to figure out a solution! Call us at (773) 801-3734 to schedule your free consultation.